Russian manufacturer of equipment for polymer processing - "Aleko"
Blown film extrusion lines "Aleko"
Shredders for plastics Aleko "Raptor Pro ®"
Crushers for plastics Aleko "Raptor Pro ®"
Dosing systems Aleko "ProDose ®"
We are glad to welcome you on the site of the GC "Aleko" - the largest Russian developer and manufacturer of modern equipment for polymer processing! The group of companies "Aleko" has been successfully working in the polymer market since 1992. For over 20 years we have been supplying equipment for polymer processing and have been manufacturing this equipment for more than 10 years. 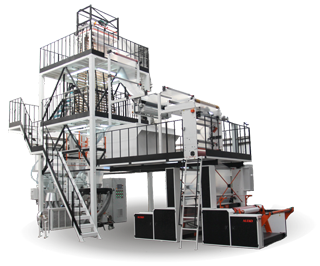 Today, Aleko Machinery manufactures lines for the extrusion of polymer films, dosing systems and grinders of polymers, supplying these machines to many enterprises in Russia, CIS countries, Europe and Asia. We are constantly learning new types of equipment. Machines produced by the GC Aleko successfully work in many regions and countries. The supply of our machines have been made to Siberia, the Far East, the Central and Southern regions of Russia, the Volga region and the Urals, Germany, Bulgaria, Czech Republic, Vietnam, Ukraine, Belarus, Kazakhstan, Turkmenistan and other countries. We sell products at affordable prices, providing all necessary guarantees. The Aleko group of companies is a close-knit team of professionals with extensive experience, united by a common idea and goals. Our specialists know about polymers and their processing everything, but they do not stop there, developing innovative technologies that will surely provide you with profit. If you need to buy equipment for polymer processing - contact the GC Aleko!